Wave conditions can be helpful to fly long distances, but they can also complicate things along the task. This section addresses both of these situations. How Do I Use Wave On Cross-Country Flights? – Flying Along the Wave. If a long uninterrupted mountain ridge is producing wave lift it is possible to fly in continuous wave lift parallel to the mountain range. The lee side of the Sierra Nevada often offers such conditions. It is best if the wave is of moderate strength because very strong winds necessitate a major crab angle to stay on course, which reduces the speed over the ground. If the wave-triggering mountain range is interrupted, challenging transitions from one wave to the next may be required. Especially upwind transitions can be very difficult because they often lead through areas with strong sink. In combination with the high speed required to push upwind, they can result in massive losses of altitude: the next wave lift may then simply be out of reach. Airspace regulations can be another constraining factor because the geographic extent of wave windows (where high-altitude flying is permitted) is usually very limited. The maximum legal altitude before a difficult transition may simply be insufficient to reach the next wave. It is possible to fly downwind by exploiting wave lift from multiple mountain ranges in succession. Returning upwind, however, is usually very difficult or impossible. How Can Wave Aloft Complicate Thermal Flying? Wave aloft can change where thermals form below. The best locations for thermal lift will be under the crest of each wave, whereas the area directly below wave troughs will produce little or no thermals. If there are cumulus clouds, it is possible to see this happening: the best cumulus clouds will be under the wave crests whereas under wave troughs the air will be mostly clear. This could at first appear as (frequently interrupted) cloud streets but the odd thing is that these kind of “streets” will not form in the direction of the surface winds (as they normally would), but perpendicular to the wind aloft. The clouds may still be elongated in the direction of the surface wind (i.e., the direction in which the street would normally form), but they will appear parallel to each other rather than in a row. The best way to see this is by looking at the cloud shadows below, rather than by looking at the clouds themselves. If there are continuous, normal looking, cloud streets, there may still be wave if the winds aloft are from a different direction than the surface winds. In any case, the best lift will usually be found on the upwind side of the clouds but the rotor turbulence caused by the wave aloft will make the thermal lift weaker, rougher, and less well organized. In may be possible to get into (weak) wave lift by flying into the wind directly from the cloud base on the upwind side. All of this can of course also exist in blue conditions. However, in this case it may be next to impossible to figure out what is going on. How Does Wave Complicate Ridge Flying? We have seen that for classic mountain wave conditions to exist, the temperature profile of the air must be stable at the level of the ridge tops. This implies a shallow convective layer that does not extend above the height of the ridge producing the wave. This means that the wind will be forced into a narrow channel between the ridge and the inversion layer above. The inversion pushes the wind down, and the ridge forces the air to go just over the top. Under such conditions, wind speeds at ridge level will be very high, ridge lift below will be very rough and poor, and it will be impossible to climb much above the top of the ridge, if at all. A few hundred feet above the ridge top, the airflow may even start to descend a little upwind of the crest of the ridge. Despite the strong winds blowing at the ridge, you may find the ridge to be “not working”. The reason is the stable air at ridge top level, which keeps the air from rising, accelerates the wind speed, and triggers the wave downwind of the ridge. Obviously, if a ridge is not working, it is best to fly away from it. Conditions near the top could also be quite dangerous. Often it is possible to find some thermals a little upwind of the ridge, under the crest of the airflow above. However, even those thermals are unlikely to extend much beyond the top of the ridge. If the layer of stable air is considerably higher than ridge-top level (i.e. the convective layer extends well above the ridge), it is possible to find strong thermals directly over the crest of the ridge, and wave flow above. In this case, the wave isn’t immediately triggered by the downwind slope of the mountain range itself, but by the “downwind slope” behind the thermals. In addition, it is likely that the ridge will also produce good ridge-lift on the upwind side. 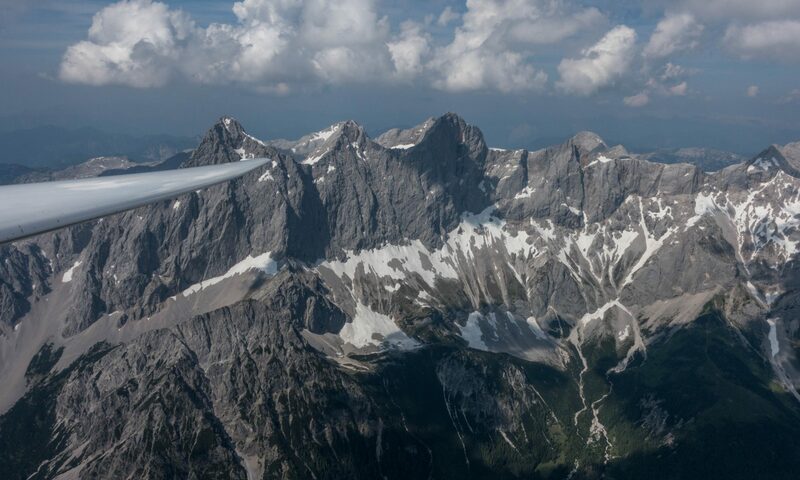 This is a great scenario for mountain flying: good ridge lift below the ridge and powerful thermals along the ridge crest, enhanced by wave flow above. The wave itself, however, is likely to be weak and out of reach. It will likely also be uneven and interrupted, because the thermals along the ridge are also uneven, and their tops will likely also vary considerably. The conditions on ridges located downwind of the slope that triggered the ridge will depend on whether they are “in phase” or “out of phase” with the wavelength. If the downwind ridge is “in phase”, i.e., the crest of the wave flow is directly above the ridge top, the convective layer will likely extend above the top of the ridge, and the ridge itself will be working as well. If the downwind ridge is “out of phase”, i.e. the trough of the wave flow is directly above the ridge top, any thermals from the ridge will be unorganized, wind-blown, and capped by the inversion above. The ridge itself is also unlikely to work with the potential for heavy turbulence. There may be good thermals under the wave crest, however, approx. half a wavelength upwind of the ridge. Moderate changes of the wind speed over the course of a day will alter the wavelength and could turn an “in-phase” ridge into an “out-of-phase” ridge or vice versa. If there are (rotor-) cumulus clouds directly above the ridge, it is likely “in-phase” and if the clouds are further upwind, in front of the ridge, it is most likely “out of phase”. On blue days it may only be possible to determine if the ridge is “in-phase” by trying it out to see if it’s working. When approaching the ridge, do so from a shallow angle and maintain a good safety distance until you get a good feel for the conditions. If the downwind ridge is at an angle to the slope triggering the wave upwind, it is likely that parts of the ridge will be “in-phase” while other parts will be “out-of-phase”. If there are clouds above the ridge they might show the locations where the ridge is “in-phase”. Often neither the upwind ridge nor the downwind ridge is straight, and so it can be quite tricky to figure out which parts of a ridge are likely “in-phase” vs. “out-of-phase”. It’s even more complicated when the wind is blowing at an angle. Not only does this make it very difficult to estimate the distance between two ridges and therefore to estimate where a ridge may be “in-phase”. It may also lead to changes in the wind direction near the surface: the wind seeks the path of least resistance as it is forced to stay low below the inversion and faced with the obstacle of a mountain ridge. If it is blowing at an angle, the path of least resistance may be along the ridge, rather than over it – especially if the ridge is not very long such that the wind can find a path around it at its end. If you are flying along a ridge that’s working well you may (suddenly or gradually) come across an area that is not working at all. Remember that wave flow above may be the reason and your ridge that was just “in phase” is now “out of phase”. Turbulence behind spurs and in bowls may provide the first indications that a ridge transitions from “in-phase” to “out-of-phase”. Also observe the clouds if there are any: are they on top of the ridge, or have they moved in front of the ridge?